My friends and I have an amazing stay here! 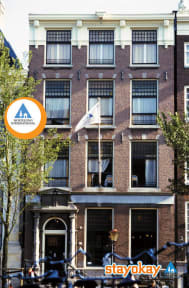 It felt safe and welcoming and would definitely come back and recommend it to anyone thinking of staying in Amsterdam!! Excellent place and location to stay. Good amount of showers and toilets. Good quality of food in breakfast, and excellent bar. Super friendly and helpful staff. Really close to a variety of activities. Rooms and bathrooms were clean. The bar was a nice hang out spot. There’s nothing about this hostel to complain about! Staff was very friendly and always willing to help out no matter the time! The rooms were great and plenty of bathrooms and showers which was nice. I had a frustrating time; the front desk was very disorganized, and someone was sleeping in my bed when I got there. I had to find a different bed. The staff told me they would change my reservation to reflect this, but then they did not and the cleaning staff threw out some of my belongings. When I informed the front desk, they said they would compensate me and then never followed through. Very disappointed. 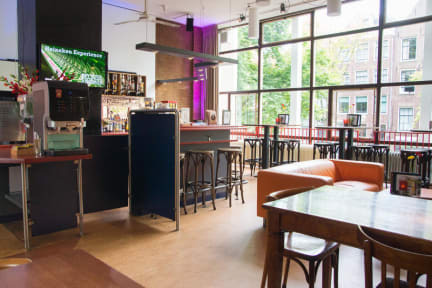 This hostel has an amazing location and so if you plan on being out your entire stay in Amsterdam then it's fine. Otherwise it is not worth the amount they charge! The dorm rooms don't seem like they were dusted. The bed is not made for you when you arrive. Staff is really not very friendly. The atmosphere is quite dismal. Also my dorm was on the ground floor and I had to go to the first floor for a bathroom and shower. I know Amsterdam is expensive, but I really did not enjoy staying here. It was one of the worst experience I ve had in a hostel. The location it is the only positive aspect of it. The room are crowded with super small bunk bed, the lockers are in the hallway, the common area is almost non existent, with a general decadent feeling. I had to ask to be moved to another room because the one I got assigned to was so smelly that it was impossible even to sleep there. The following night the female dorm I was staying into become a mix dorm without even saying it. Location is pretty good. They charge you for locks and towels. The 20-person rooms that are only accessible via two stories of stairs are all concrete, so even somebody snoring on the other side of the room sounds like they’re right next to you. The mattresses are all cracked and there are seemingly no fitted sheets. The bathrooms smell odd and the shower stream was pitiful. There is zero atmosphere and nothing in the hostel is conducive to meeting people. The receptionist was kind, however.